Flickr is going bonkers for me today so I've uploaded my pics with blogger. Just click on the image for a bigger view. I finished another mixed-paper book! These things are addictive! I'm already planning the next one. I've ironed out some problems from the first one and am very pleased with how this turned out. 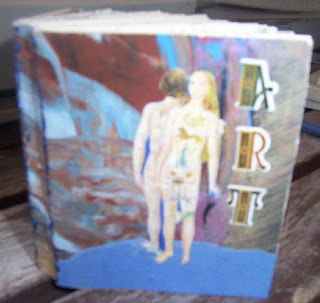 It measures 3.5 x 3" and is made up from the pages from the brochures and mostly the leftovers from the previous book. This is a great way to use up leftovers. This one is going to be a doodle book. I'm going to practice all my doodling patterns in here. I also christened the first book and did a journal entry in it last night. 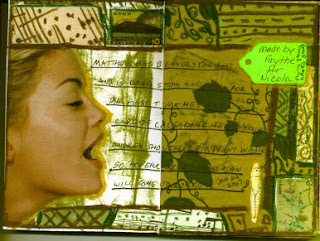 What fun to work in a book you made from scratch! Back to the mystery envelope. I have three items left in the envelope (plus the envelope itself). First a big piece of gold paper that I've been saving just because I simply love it. I'm going to hold onto this until I find the perfect thing for it. The last two items I've saved because I knew exactly what I would do with them. A small very old crochet pattern and a 1950s issue of Workbasket. These are perfect for my altered book. An early 1900s book called "Lady of the Decoration" which has a theme of vintage ladies and centers around various ways women decorate themselves or their surroundings. 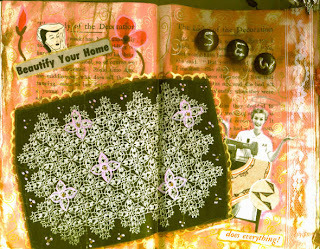 Now that I was left with these items I was chomping at the bit to work in the altered book again. Click on this image to get a much better view. I've also got ideas for another spread that will be up next.